Video cost: Let’s get down to brass tacks and talk about real numbers as it relates to real world project. This is pretty much the first thing I get asked by a prospect. The answer, of course, depends on a myriad of variables, all dependent on one another to determine the full scope of the project. Clients often ask this far too early in the process. They ask before they even know what they want or what they need. So first things first. Figure out your brief and scope (see this article Client Guide: Write A Video Brief To Save Time And Money ). And then come back here and get yourself some numbers to get you in the right ball park. I put some blood, sweat and tears into this article, so you don’t have to. All I ask is that you be patient through the few shameless plugs that I inserted. Pro-tip: Don’t ask for the price in the first email or else they will think that’s all you care about and then they will know you are just going to go to the cheapest place and not consider the value and how it will affect your business. Think about this before asking about the cost of a video: How much is a customer worth to you? What is your current growth rate? Where do you want it to be? What is the biggest issue trying to accomplish your goal? What is that costing your business? What is the impact on your business if you fix this issue? For direct-to-clients jobs, I personally charge a combo of an estimated project rate and day rate for revisions. So the estimated project is for a full draft with no revisions built in (or minimal), then a day rate for any further revisions. I also use project milestones to keep the project on track and prevent scope creep and extensive revisions. To me, it’s just as important for the client to get a fair deal and get what they asked for as for me to get paid properly for the job. Video cost can be a little mystifying and somewhat akin to finding out how much a medical procedure is going to cost. There’s how much your insurances is going to cover, which wildly differentiates, then there’s how much the hospital charges you based on their blue book rate and what they think you can afford. It’s frightening, and kind of crazy. Every place is different and you don’t know who to trust. Thankfully there are some standard industry ethical price guidelines that Graphic Artist Guild Handbook (now in its 21st edition) have helped established. It still can vary, but at least it’s someplace to start. According to a survey done by the Graphics Artist Guild in 2013, here are the average fee ranges for computer animation based on a finished second. There are 10 basic industry categories to break it down. I’m omitting Flash because I don’t deal in Flash and it’s quickly becoming outdated. Medical/Scientific Imaging $215-2,500 per second. Web, Large Client $200-1,000 per second. Web, Small Client $120-800 per second. Medical/Scientific Imaging $165-2,000 per second. Web, Large Client $300-2,000 per second. Web, Small Client $325-1,500 per second. So let’s just break it down to really quick to a real world 2-minute explainer video. Explainer videos, to me, are under the “Corporate” industry. It is sort of “Advertising” as well but for the sake of simplicity and clarity, let’s just call it “Corporate”. So on the low-end, a properly estimated 2-minute explainer video would run around $9,000 for 2d and $16,500 for 3D. That’s about right for a bare bones video. On the absolute premium high-end it would run $150,000 for 2D and $180,000 for 3D. And these prices are 3 years old! These may seem a little high to you, but the as with most things you buy, the amount you pay depends on a wide variety of factors. In this case, the style and length of the video are the two most important. Pricing is also affected by the level of detail, resources available, customization, schedule, and the complexity of the animation. Dropbox famously paid $50,000 for their 2-minute explainer video. Depending on the source, the estimated ROI for Dropbox’s explainer video was between $24 million and $48 million. Now that’s bang for the buck! I tend to use a hybrid method of 2d and 3d for the explainer videos that I do so the average starting price for a direct to business client is $15,000 for a 2-minute explainer video, taking anywhere from 6-8 weeks to complete. This includes: • Fully original script concept •Customized artwork • Meets brand standards• Music, SFX and Voice-over • Professional mix and finish • Mix 2D and 3D Elements • Basic Marketing & SEO • 1 round of revisions. Day rate for any additional revisions. This was a video I worked on at Arc Worldwide/ Leo Burnett for Crest P&G. I wasn’t privy to the exact cost but I know that there quite a few hands in it. There was a producer w/ several PA’s, a dedicated audio person, professional VO talent, an internal team, creative lead, lead animator & designer & editor (me) and an assistant animator. So something like this is going to cost more than something like the Feeding America video which was me as animator/editor/audio and an art director/producer. It was for a charitable cause so it had a lot tighter of a budget as well, but was also simplified to more a light kinetic type/ infographic/ slide show. A lot of my clients are agencies and post-houses. 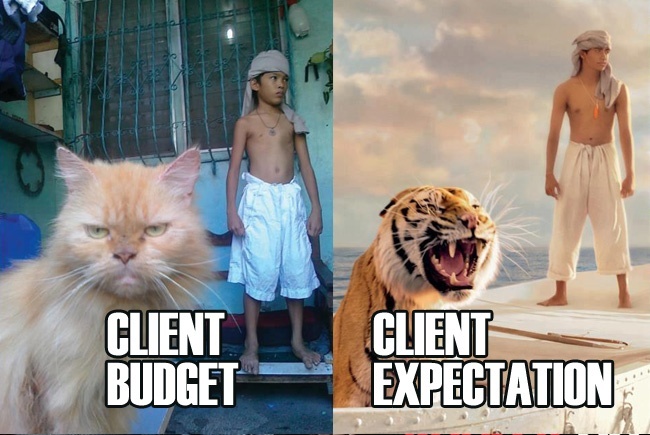 I know that one famous post-house that I’ve worked for is rumored to charge around $1,000 per hour of their design department (I’m being vague for a reason: I like this client and I don’t bite the hand that feeds!). I’m not sure if that’s an “all-hands-on-deck” scenario or not, and depending on day that can be 8 – 10 designers, so that would make sense. But they also have a tremendous overhead. Much like our industry, costs are constantly in motion and it’s all relative to specific circumstances. There’s also additional fees to consider. Have a look at what typical “terms” are for a short contract. Now you might be able to see why it’s important to know what you want before starting to ask about prices. This guide is just scratching the surface about what you can expect in terms of video cost because every situation is completely different and usually requires a custom estimate. Since these prices are over 3 years old, (4 if you count when the survey was taken), I expect there to be discrepancies, but at least it will give you a place to start and understand how much a reputable and reliable place is going to charge you. At the end of the day choosing the right video production company should not just revolve around price but also style, experience, communication and how much the company is going to work with you to meet your goals and give you the best return on investment. That being said, everything is open to negotiations. Just like price shouldn’t be everything for you, money isn’t everything for video production houses. Maybe there’s something in your project that you can use as a bargaining chip to reduce some of the cost. Are you easy to work with? Is your project cool to work on and does it allow for creative freedom? Does it present interesting new technology challenges or push the tech envelope? Would it be cool as a process case study or showcase piece to a portfolio? Is it high-profile? Could it get them free press or publicity? Is a long-term relationship possible? One of the biggest ways to save is to shift your timeline to the slower part of the quarter. For instance, May & June is always slow for me for some reason. I’m always willing to give deals during those months. Now, I have a very detailed custom proposal that I make for serious work inquiries. You will get info on rates, services, case studies, testimonials… all the usual things you see in a proposal. You will also receive a detailed project evaluation where I give some concrete options based on our initial consultation and recommended video strategy to achieve your goals. You then get a pricing guideline, a complete budget breakdown, and an average project timeline. Accept nothing less from any future proposal. It’s important to paint a full picture as well as a clear visualization of victory.